RevoNeck will help you style your hair and make sure you always have that perfect line! 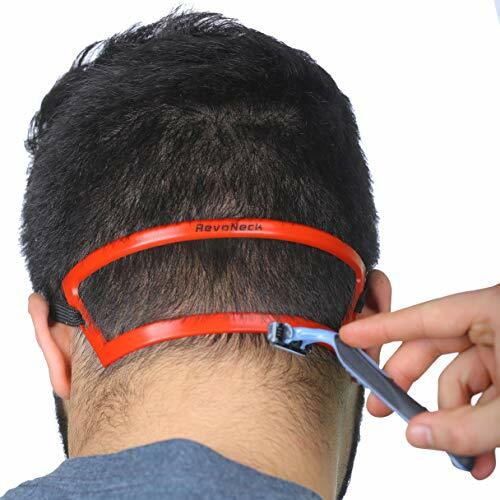 Ultimate Neck Hair Shaving Guide – RevoNeck is a shaving stencil made to help you trim your excess neck hair to keep your haircut looking fresh. Tired of constantly visiting the barber because your neck hair is messy? Then RevoNeck is your grooming solution! Also makes for great barber supplies. One Size Fits ALL – Do not worry about sizing. All our Revo products are engineered and designed to fit all shapes and sizes! In fact, all our Revo beard & hair styling products are a universal fit! Save Time & Money – Barbers are expensive and your hair will just keep on growing. We are here to help save you MONEY by reducing barber visits! RevoNeck will give your neckline a fresh shave, and keep you looking like you just came out of the barbershop. Do It Yourself (DIY) – RevoNeck allows you to edge up your neckline all by yourself! No need to ask for help from others or pay the barber, instead RevoNeck will give you that perfect line up. Self cutting has never been easier! Compatible with ANY shaving/cutting tool – Whether it is razor, trimmer, or straight blade, RevoNeck is designed to work with anything! Makes great addition to your grooming accessories!